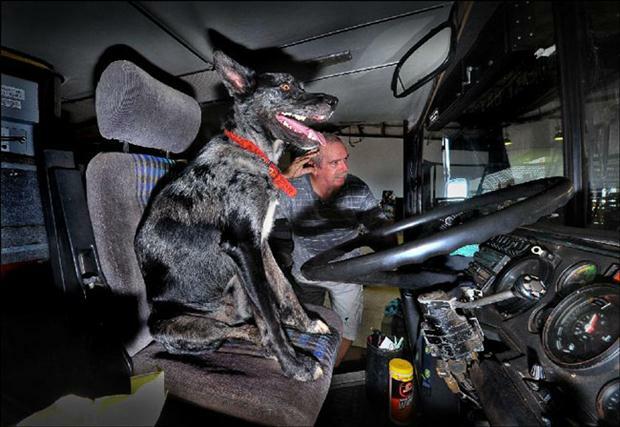 In Darwin, a two year old dog was found driving a double-decker bus. Sales assistant Phil Newton said that he saw a dog in a 20 tonn double-decker bus's driver's seat with its paws on the steering wheel. He chased the bus and got inside an open window and used the handbrake. The bus ran over almost 200 metres, went up to a footpath and was about to hit a parked car. The 'Super' Dog's owner, Richard McCormack said that the dog used to watch him driving and just copied what he did. It was not the first time his dog is doing so. It has seen him releasing the handbrake many times and just tried it out. Woodley, Mr. McCormack's dog, took the bus when he parked the bus and went out to inquire about something. After a couple of minutes, he saw his bus moving. "I came out and saw the bus going down the road. I couldn't believe it, he said. 0 Response to "Two year old Dog drives double-decker bus"